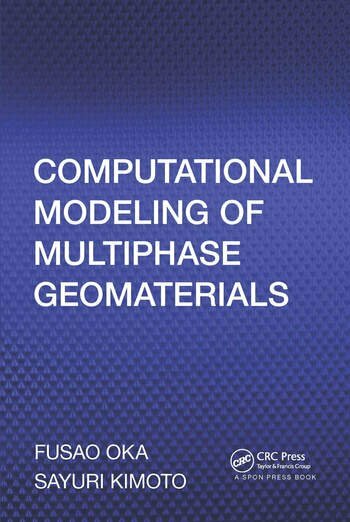 Computational Modeling of Multiphase Geomaterials discusses how numerical methods play a very important role in geotechnical engineering and in the related activity of computational geotechnics. It shows how numerical methods and constitutive modeling can help predict the behavior of geomaterials such as soil and rock. After presenting the fundamentals of continuum mechanics, the book explores recent advances in the use of modeling and numerical methods for multiphase geomaterial applications. The authors describe the constitutive modeling of soils for rate-dependent behavior, strain localization, multiphase theory, and applications in the context of large deformations. They also emphasize viscoplasticity and water–soil coupling. Drawing on the authors’ well-regarded work in the field, this book provides you with the knowledge and tools to tackle problems in geomechanics. It gives you a comprehensive understanding of how to apply continuum mechanics, constitutive modeling, finite element analysis, and numerical methods to predict the behavior of soil and rock. Fusao Oka is a professor in the Department of Civil and Earth Resources Engineering at Kyoto University. Sayuri Kimoto is an associate professor in the Department of Civil and Earth Resources Engineering at Kyoto University.